“Had a very wet CBT today. Brand new bike supplied and two great instructors. “55 miles done so far – very happy ???? 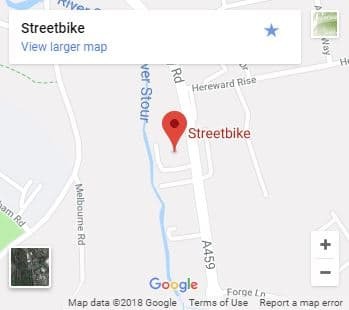 After several more visits to Streetbike where most of the staff knew me on first name basis I walked in and you jumped out of your seat and said don’t move anywhere I want to see you. He said “what do you think of this beauty ” I said “Wow that’s stunning!” After sitting with him for a while – I was having that bike! “Thank you Gary and Alex for making my Yamaha R1M purchase a memorable and pleasurable experience. Fantastic morning today followed by 60 miles out to Bridgenorth this evening. What a bike! “Many thanks Martin for your help with buying the Tracer, you and the sales team are a credit to Streetbike! I certainly have not had such a nice experience buying a bike as I have had with you guys, first class! The bike looks great with the comfort seat as well”. “I’d just like to say a big thank you to Alex for making my recent purchase of my new pre-reg’d DL650 V-STROM an easy & trouble free experience. This is the second bike I’ve purchased from Streetbike the first being a SV1000S back in 2003. Having purchased many bikes over the years from various dealers etc. I must say that Streetbike’s sales approach & customer care is second to none and I for one endorse them 100%.